Opened in 1999 and at a cost of $1.5 billion dollars The Venetian has been one of the most luxury locales on the Las Vegas strip and now you have the chance to get the bedding that guests find so amazing that they include it in almost every review of the hotel! Cloud Nine Comforts is renowned for making some of the finest bedding products and it is rare for them to manufacture such quality bedding on a scale as large as a five diamond hotel. 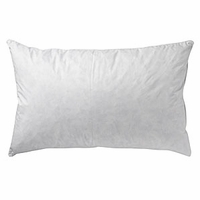 Cloud Nine Comforts 50/50 Pillow Featured at Venetian Las Vegas - Standard Size - 20" x 26"